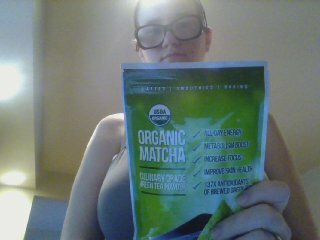 June 11, 2014 June 21, 2014 Unsure "Adult"
I got a wonderful opportunity to try out Kiss Me Organics Matcha Green Tea Powder. I was super excited and couldn’t wait to get it. The only other type of green tea I’ve really had was at Starbucks and City Brew, but I loved it there. I was excited for the chance to try to make something similar at home. When I got the powder, I was a little nervous to try it, to be honest. I didn’t even know that you can buy green tea powder. I didn’t know where to start or what to make. I began researching on Pinterest and found tons of recipes. 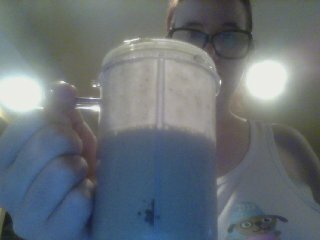 I decided I was going to make a shake. I do green smoothies for breakfast with spinach and such and with 3-4 kids under 5 years in the home at all times, I don’t take a lot of time to bake or anything very often (note to self: make banana bread before bananas go bad). I know how to bake and such, but I didn’t want to use too much of the green tea powder and find out that I made it all wrong and that it was ruined. So, I started small. I found two recipes that looked interesting and tried to make a combination of the two. It was a horrible idea! 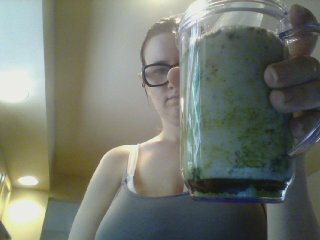 I mixed the 1 tablespoon of the green tea matcha powder with, WestSoy milk, honey, blue agave and ice. It was awful! I couldn’t understand what I did wrong. Maybe I should’ve used less organic green tea powder, whole milk, no agave–I don’t know. Maybe some day I’ll be able to find a right way to combine them to get the Starbucks Green Tea. But, this one wasn’t a success. I was kept putting this off because I wanted to find a way to enjoy it. I kept thinking, “…maybe my taste bugs are just messed up, I don’t like eggs and so many other people do…” So, I delayed and delayed and delayed until today. Yesterday I was pounding away at the keys trying to get some work done and my energy was shot. I had a goal of over 3,000 words to get done and I was stuck. I had 2/3 of my work left to do and I couldn’t focus to save my life. I started talking with a friend who eats completely organic! Asked if she used any natural green tea powder and I was ready to just quick and send her the powder. She told me she did, I explained how I had tried to make a smoothie and ended up pouring 3/4 of it down the drain. She gave me some tips and I got it to work! It took a little bit of patience, as the Magic Bullet is horrible when you have a portion bag full of frozen strawberries. But, I used 1 tsp. of the powder, 1 small container of strawberry yogurt, some milk and about 1/2 a cup of strawberries (bought them fresh, cut and frozen them myself). It was delicious! I added another tsp. to see what happened. I could just begin to taste the plant-ish taste of it. But, it was still really yummy. I am actually looking forward to trying more of the matcha green tea powder recipes from Pinterest. Right now, I will say, it’s delicious in smoothies with other fruits and veggies. The powder gave me the energy I needed to make it until I could go to bed–didn’t get all my work done, but that was my own personal choices and the result of a sick kiddo. Recommendation: Follow the packets advice and use 1 teaspoon. Next postWhen Did We Start Hating Big Families?